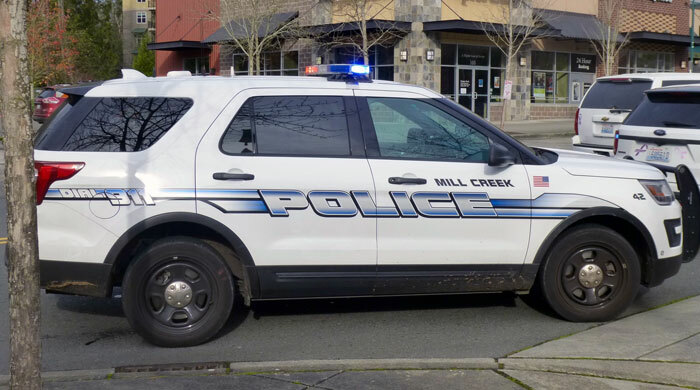 According to the latest Mill Creek Police Blotter, a total of 427 responses were reported the week of January 18th to January 24th, 2019. 01:23:03 - 13500 BLK NORTH CREEK DR: Police responded to an assault in the 13500 block of North Creek Drive. Subsequent to investigation, a female was arrested for Assault 2 and Malicious Mischief 2nd Degree, both with a domestic violence label. 11:57:32 - 15600 BLK MAIN ST: Mill Creek officers responded to a theft in progress in the 15600 block of Main Street. A Mill Creek male was arrested, cited and released from the scene. 12:52:24 - 13900 BLK 31ST DR SE: Officers responded to a counter complaint about a Fraud case. A 23 year old Mill Creek woman reported she was a victim of a fraud involving her email account. 13:34:27 - 2900 BLK 143RD ST SE: Police took a theft of license plate report originating from the 2900 block of 143rd Street SE. 12:56:02 - 15800 BLK VILLAGE GREEN DR: Officers responded to a counter complaint regarding a Theft case. A 61 year old Mill Creek woman reported her adult daughter had stolen thousands of dollars from her while she was medically incapacitated. The case is under investigation. 20:58:04 - 13800 BLK NORTH CREEK DR: Officers responded to a theft in the 13800 block of North Creek Dr. A bike was stolen from a porch. 14:42:54 - 1900 BLK 151ST ST SE: Officers responded to a report of a dog bite at the 1900 block 151st ST SE. A 26 year old Renton woman was bitten by a dog at the residence and suffered a minor injury. 16:07:00 - 13500 BLK NORTH CREEK DR: Police responded to a welfare check in the 13500 block of North Creek Drive. As a result of a police investigation, CPS was contacted. 07:45:40 - 4300 BLK 137TH PL SE: Multiple unlocked vehicles were prowled near the 4300 block of 137th St SE. 10:21:05 - 15100 BLK 35TH AVE SE: Two men burglarized a local business in the 15100 block of 35 AVE SE. 18:53:23 - 16300 BLK BOTHELL EVERETT HWY: Officers responded to the 16300 block of Bothell-Everett HWY for a female sleeping in her vehicle. A 27 year old Lynnwood female was arrested and booked into the Snohomish County Jail for Physical Control. 04:23:27 - 16300 BLK BOTHELL EVERETT HWY: Officers responded to an alarm in the 16300 block of Bothell-Everett HWY. A business had been broken into and the investigation is on-going. 07:56:30 - 1500 BLK 136TH ST SE: A student reported that his school laptop was stolen out of a vehicle over the weekend. The vehicle prowl did not occur in the City of Mill Creek and the potential victim did not file a police report with the appropriate agency. A report will be conducted to provide the school district a case number so a track of the laptop can be conducted. 17:46:34 - 15600 BLK MAIN ST: Officers responded to the 15400 block of Main St for a theft report. A 54 year old female was cited and released for Theft 3rd degree. 19:23:11 - 2500 BLK 132ND ST SE: Officers stopped a vehicle for speed. A 24 year old Lynnwood male was cited and released for DWLS 3rd Degree. 20:23:26 - 13400 BLK DUMAS RD: Officers stopped a vehicle for a registration violation. A 26 year old Arlington female was cited and released for DWLS 3rd Degree and a 23 year old Mill Creek male was arrested and booked into the Snohomish County Jail on a Federal Felony warrant. 06:41:42 - 15300 BLK MILL CREEK BLVD: Police took a vehicle prowl report from the 15300 block of Mill Creek Boulevard after a Mill Creek woman reported her vehicle unlawfully entered and a multi tool stolen. The woman also reported damage to her dashboard. 21:55:11 - 4200 BLK 139TH PL SE: Officers responded to a domestic in the 4200 block of 139 St. SE. 13:45:27 - 1500 BLK 136TH ST SE: A Mill Creek female reported her ex-boyfriend, a Kenmore male, was sending her threatening texts. The female did not wish to be a victim. A report was taken for documentation of the reported incident. 13:52:56 - 4100 BLK 133RD ST SE: Officers responded to a death investigation in the 4100 block of 133rd St Se. An 83 year old woman from Mill Creek was found deceased due to natural causes. Click on this link to see the January 18th to January 24th, 2019, Mill Creek Police Blotter.